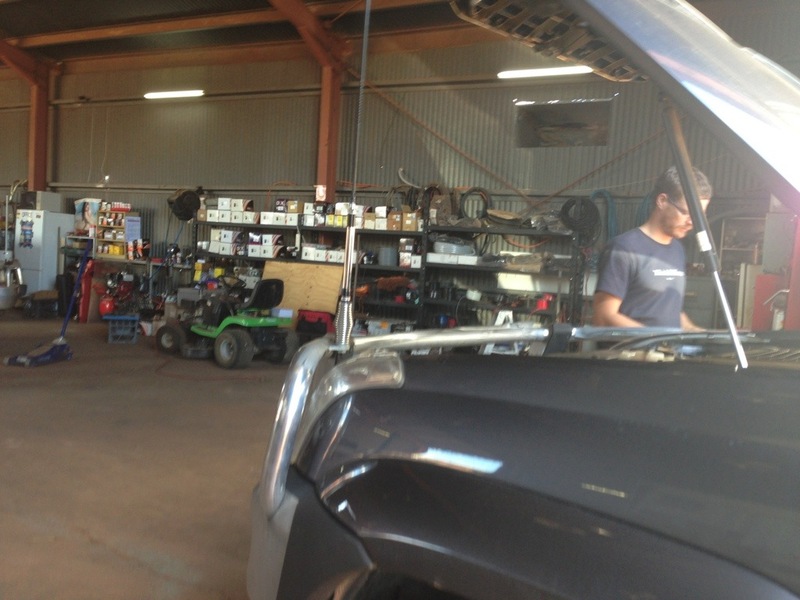 A Breakdown Not Solved – Grrrrrrr! GRRRRRRR! Back at the Auto Electrican this morning. Well for those of you who aren’t in the Facebook loop, you would not yet know that tonight we are back in Tennant Creek after only travelling 60km’s down the road this morning to find the car throwing the same problems (air conditioning goes, dashboard ‘check engine’ lights up, indicators etc go, battery starts losing charge) as the pre, new alternator breakdown. Thank goodness for our RACQ membership (so grateful) as they have now upgraded us to a cabin for the next two nights while the car and camper wait in the queue to get back to see the Auto Electrician tomorrow afternoon. 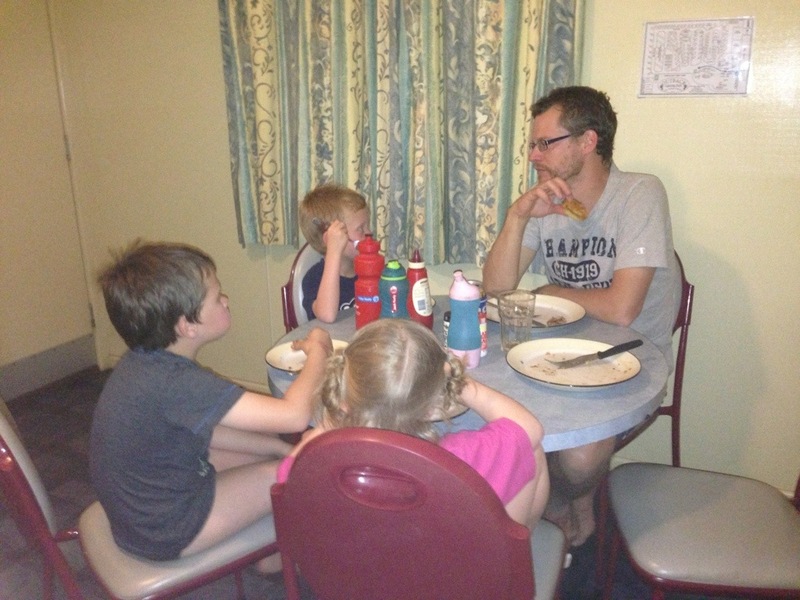 Dinner in our cabin tonight – feels so strange! We’re trying really hard to stay calm and positive about this. I went for a walk this afternoon and did a loop around town trying to work out just exactly what the universe is trying to tell us we need to do here before we can leave. I didn’t come up with anything other than buying a lotto ticket from the newsagency tomorrow morning – cross your fingers for us. We really don’t know what is wrong with the car/camper – Matt thinks it may be something to do with the Electric Brake Controller/Trailer plug blowing our ignition fuse, which then kills the alternator, which then means the battery dies?? That’s about as much as I can follow. We’re really, really hoping for a quick fix when the auto-electrician can squeeze us in tomorrow afternoon. We are bummed because we were meant to meet Matt’s dad and Rema tonight who have just arrived in Mataranka from Cairns to travel with us for a few weeks – hopefully we will be sitting in the hot spas with them soon! Matt is forgetting about the day with some ‘man cave’ time and a scary/violent movie I would never sit through, on the iPad. Me – I think I’m just going to ‘blog’ (block) it out and keep the blog posts rolling – we are nearly all up to date again! We’re thinking we might have to give it a go to write a magazine article for one of the camping/camper trailer mags – an attempt to try to mitigate some of the damage the trip budget has suffered, the criteria for the articles is a little daunting though!! Anyway – to finish, back by popular demand (hehehehe – thanks Lee – a very loyal reader who we haven’t yet even met! No need to instigate the BBFPOTD Facebook Page just yet! ) is favourite part of the day. Let me tell you, Matt and I had to scrape the bottom of the barrell hard for ours tonight!! Jess – getting back on the road this morning and seeing this on the highway ……..
What was your Favourite Part of Today? C’mon ………. join the fun, you know you want to! PS. Go the mighty Maroons!! If Sonia can pick on Matt then so can I.
I have the Toyota recovery vehicle ready if you need me, Nissan Navara. hehe Murray too funny!! 😉 yaaayyyy BBFPOYD is back!!! Had to laugh – The kids fpotd was about RETURNING to the ‘good’ things in TC and the parents were about LEAVING TC!! Aghh simple pleasures of a child! Well you asked… so i’m joining in!! My FPOTD: learning a very important lesson about self doubt / trusting yourself and that it really is darkest before the dawn and no matter how long it takes things really do become clear with the dawning of a new day. OH and some wonderful news from a clever accountant!! 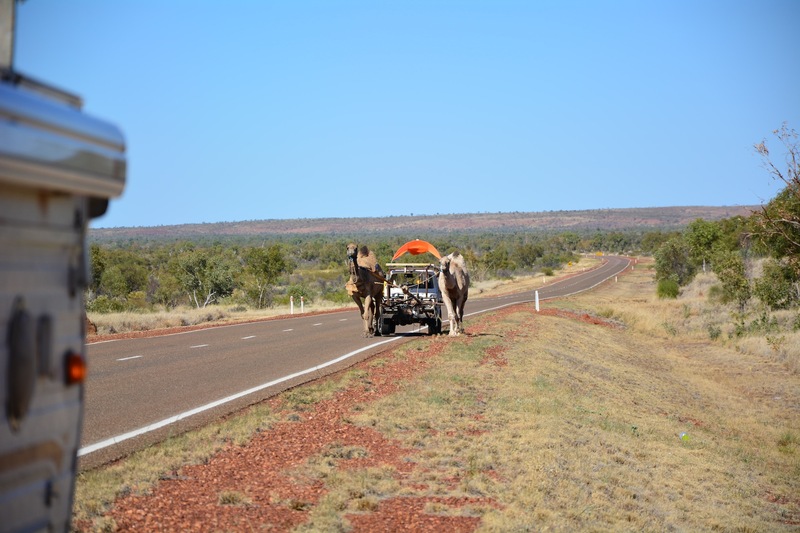 Car troubles are a horrible part of the trip – I have serious trust issues with our Patrol (in Nissan’s defence we did swap the engine to a Brunswick V8). Hope that it is something simple and you are on the road again soon.